Dr. Pat McCloughan of PMCA Economic Consulting was delighted to speak at the seminar hosted by investment advisers TierOne at their offices in Fitzwilliam Street, Dublin on 30 June. His presentation, which looked at the prospects for the euro, the wider European project and the Irish economy, can be viewed at: PMCA Presentation (300611). 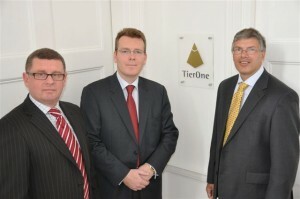 Pictured at the TierOne Seminar on 30 June 2011 are (L-R): Kevin Coghlan, Managing Director, TierOne; Dr. Pat McCloughan, Managing Director, PMCA Economic Consulting; and Graham O'Neill, Director of Investment Policy, TierOne. 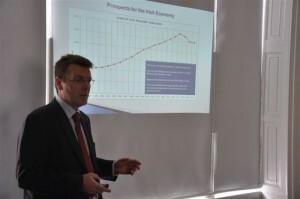 Dr. Pat McCloughan of PMCA Economic Consulting presenting analysis of the Irish economy during his address at the TierOne seminar on 30 June 2011.